Piedmont has some of the best and most beautiful places for hiking that I’ve ever had the fortune to trek. 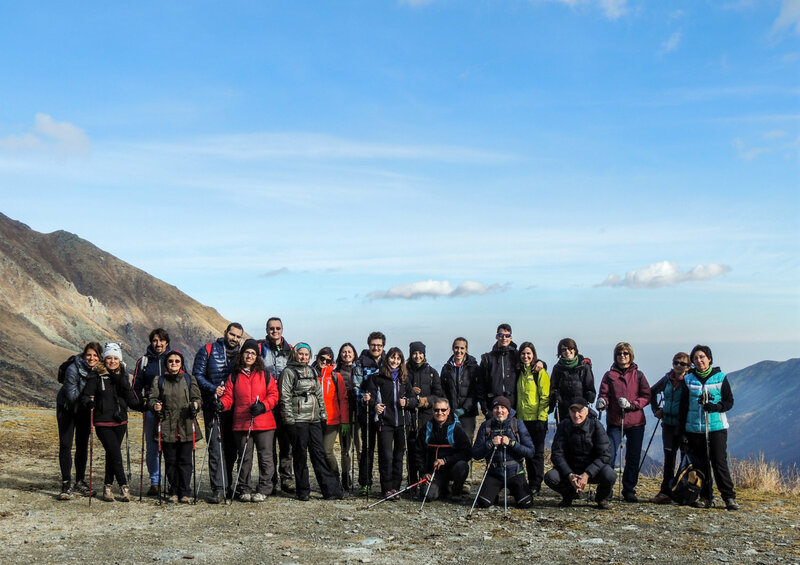 At the beginning of this year, I found a local hiking group called Duma c’Anduma, or “Come on, let’s go!” in Piedmontese dialect. Every Saturday and Sunday, the group’s fearless leader Gabriele Ferreri takes a group out into the wild for a hike that can go anywhere from two hours to seven or more. There are also some hikes at night, others during the week, and of course some trips that last several days (at this point, I’ve only been able to go on some of the weekend hikes). I grew up around so much forest and nature that I took it for granted. Now, getting out into clean, fresh air with nothing around except mountains and sky—and a fun group!—is absolutely restorative. For anyone searching for a good hike, here are the places I’ve been with the group so far. They’re all highly recommended, and I’d go back in a heartbeat. For my first hike with the group, this was a great starting trek. It was all uphill, but pretty gradual and it even began on a one-lane road (perfect for talking! Indian-style lines can be rather silent). The mountainscape was up high enough (we reached 1814 m) that few trees grew at the windswept top. Climbing up, we passed by ancient stone houses where people once lived. The easiest hike I’ve done with the group (though there were still several climbs). This was convenient for its vicinity to Turin, and perfect for a morning hike if you’re in the area. It goes along dirt and gravel roads through forest and field, and ends up in the hillside town of Pavarolo with its castle. The longest hike I’d done in quite a while, the 22 km wound through a forested area with many different paths traversing it, some of them trafficked with horses and bikers. We went on the very first day of spring, and flowers bloomed all along the trail sides. Although rather long, the climb is mostly gradual except for the climb up to Moncuni. The views are fantastic, and if the day is clear you can see the “Grande” and “Piccolo” Lakes of Avigliana and the Sacra of San Michele, or St. Michael’s Abbey, the symbol of Piedmont. The starting point for this trail is in my favorite kind of town in Piedmont: Alpine villages (or pre-Alpine, in Foresto’s case) made of slate and stone, with narrow streets and beautiful views. We took a side trip to see tall cliffs that formed an orrido, or ravine, carved out from a fast-flowing stream over eons. Nearby, houses were built directly into the stone centuries ago, still standing today, for keeping plague victims away from the rest of the population. Although the total climb looks tame compared to the hikes above, it is all in the first twenty minutes of the trail! The Sentiero del Ginepro, or Juniper Trail, is located in the Natural Reserve of the Ravine of Foresto, created to protect the “Coccolone” juniper tree. The trail was especially fragrant, with scents of wild thyme, oregano, flowers, and even arugula. Lou viol des fiour, or Flowers Trail in Occitan, may be my favorite. You have to go on a clear day—the views are not kidding around. This is a high elevation trek, and the mountains were covered in fields and flowers instead of trees; sometimes, the gradient was too steep for anything but rock. I’ve never felt so small, in a good way, than when walking through this valley that plunged deep between steep mountains, and up onto the crest. We did some off-road hiking, because there is a winding one-lane road frequented mostly by bikers pumping their legs uphill or zooming by so fast it gives you chills. Even in early July, the air was so cool my nose was chilly—until the sun beat down and warmed us up. The views are so fantastic, you risk craning your neck and falling off the side of the mountain. In some places, that risk is real! Thanks much for the “Flower Trail”. I’m italian but I have never go before to Vallone dell’Arma! Yesterday, with my friend, I went… It’s Amazing. I used this hike trip for o train me at onother one much more challenging: Col di Traversette and Traforo del Viso (Po Valley from Pian del Re). If you can with your Hiking Group try it! Glad to have provided a hiking idea! Il Sentiero dei Fiori really was an incredible hike. I’ll keep your suggestions in mind too — they sound great! After a few rather muggy days in Rome, this sounds so amazing right now. Major Italian hikes are high on the bucket list!